My attempt at Bento-Making! - A mummy's inane blabberings..
Yeah right..me cooking yah! Gotta admit, since the last few cooking classes I'd taken, I haven't exactly stepped into the kitchen to try out any of those dishes especially since Nenita does all the cooking at home. Nenita will be going back to Philippines for her holiday in March for 3 weeks and when she told Aidan about it, the boy had a worried look on his face. He asked my helper "Who is going to cook for me then??! Mommy??! You sure she knows how to cook?!" *Sigh* Yeah..I know I'll never be a Nigella (although I probably do eat as much as her :P). I'm not gonna pretend that I'm gonna improve culinary wise but that didn't prevent me from attending yet another cooking class. 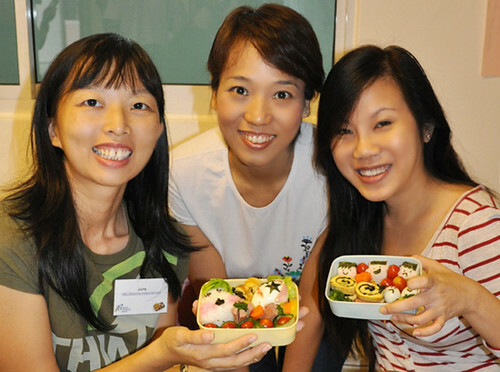 Was invited to a Health Promotion Board Parenting Event (it was held this morning) where the focus was on healthy eating for children through a hands-on creative Bento-making session. Bento-making..hmmm, that shouldn't be tooooo hard right?! Hiaks..boy, was I wrong! 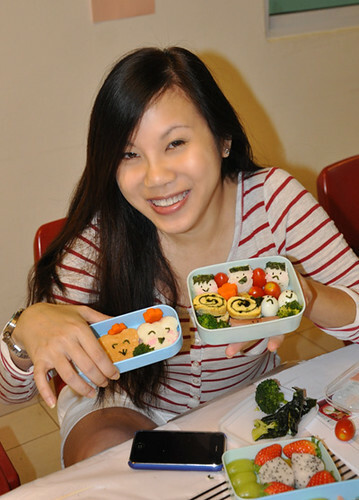 The class was led by a mommy blogger, Angie who is an avid bento maker. 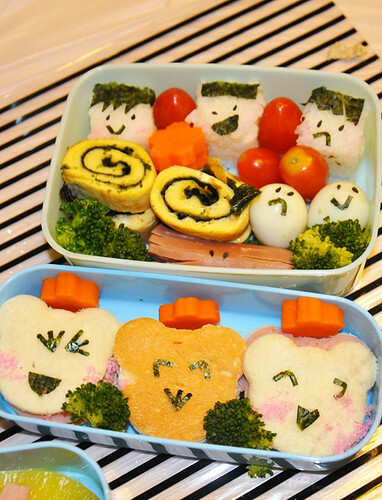 A teacher by profession, she has been making these creative lunch boxes for her family, friends & colleagues and posting her creation on her blog. 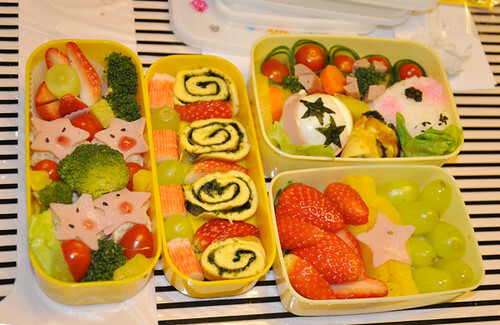 When it was time for us to start making the lunch boxes on our own after we were given a demo and shown several examples of bento boxes for reference, almost everyone seemed to know exactly what to do and went about hurriedly to get the necessary ingredients. I looked at bbhome June, who came with me for the workshop..and mouthed "HELP!!" Had totally no inspiration whatsoever. I think Angie probably saw the look of helplessness on my face and asked the class whether anyone needed assistance so I quickly raised my hands :P (truly fail lah). 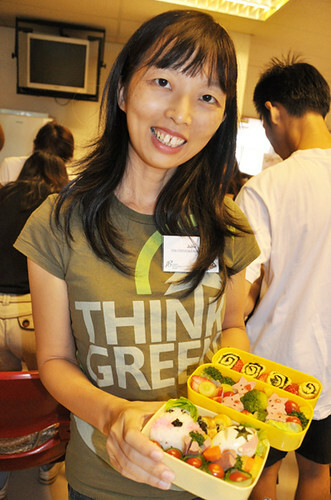 So thankfully, with her detailed demonstration and instructions, I somehow managed to complete the bento boxes within the 2 hours given to us. Honestly, cooking stresses me out! And I'm not even sure you can consider this a form of cooking since many of the items were already prepared for us. 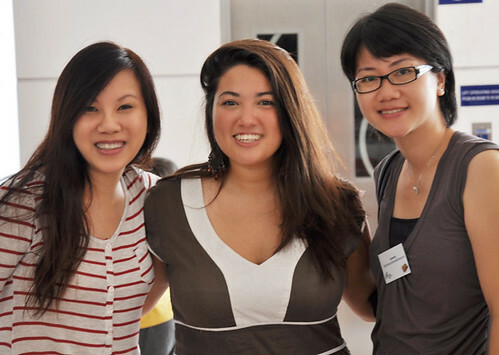 But, I did enjoy myself though (stressful fun lah :P) and it was pretty satisfying seeing the end result. 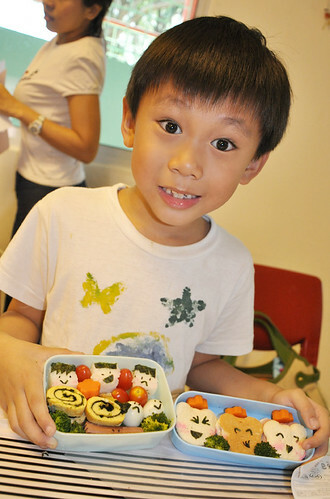 When the class was almost over, Nenita brought Aidan to the community club where the workshop was held (it was just 3 minutes walk from my place)..I proudly showed the boy my work of 'food art'. The li' bugger went "So cuteeeeee! ♥!" and promptly destroyed them by gobbling them up...>_<...Oh well, they were meant to be eaten anyway!! So cute hor :) The 'bears' are actually ham sandwiches! hehe i know..too cutesy actually but I guess it makes sense to make them colorful and cute so that kids will like them! hahaha..to be honest, we were all discussing about it and wondering whether we will be able to spend that much time preparing food for our kids. It is easier for Angie coz she's so used to doing it but for pple like me..man, just putting those sesame/seaweed eyes & mouth on the rice and bread took me ages! I will probably make the ham sandwiches since i have the mould already. The goodie-bag they gave us had some bento-making equipments and a bento-making cookbook written by Angie. Oh wow..just saw the blog u referred me to. Wow...a Humungousaur Bento!! Aidan will love it man!! But I must say that it is hard work with the cutting of the details! Knowing me, I'll just pack a tupperware of pasta for the boys to bring to school! i had loads of help lah..! cute! it's somehow like cake decoration!! haah we are too used to facebook lah! heh..not sure about cake decoration..never baked a cake before! Yah I was looking for the like button ! But it was hardwork. We were just saying that the amount of work need was too much. So tired after making 2 sets. haha i was panicking when i couldn't finish my boxes...super fail lah! I guess once u get the hang of it, you wont need that much time to do it. Must have interest lah! omg, they're super cute, but i don't know if i'd even have anywhere near the time taken to make them on a regular basis. unless i plan waaaay ahead and make it the night before. xiong ah!!! 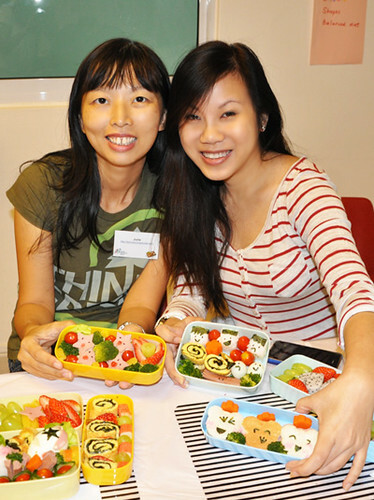 heh, we are just lazy mommies lah :) but a lot of people seems to enjoy bento-making! 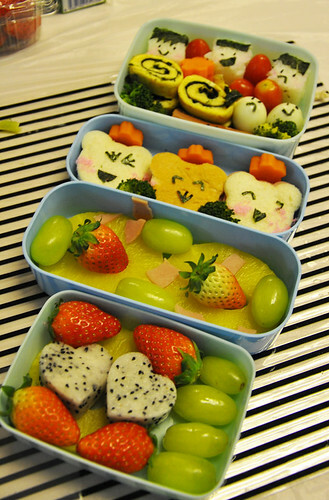 Hmm..fruit bento-boxes i think okay with making it the night before but stuff like rice/ sandwiches..should be as fresh as possible yah?! Wah so cute! Hope Aidan is now convinced that his mummy can cook for him! it's so cute lah!!! too cute to eat! heh..
Nice! The egg-seaweed rolls look yummy!! Btw, what's the pink fuzzy thing that is used to make the bear bread's rosy cheeks? These boxes r really lovely as a treat, but I can't imaging doing it everyday!!! :P end up spoiling the kids! hahaha! it was some sugarly powdery stuff that was pink in color (the packet had jap words on it) ..tasted okay, not too sweet. some parents actually do make it for their school-going kids everyday. heh, i dont think that it is consider spoiling then lah. also a way to ensure that their kids are eating healthy food!